I love nuts! 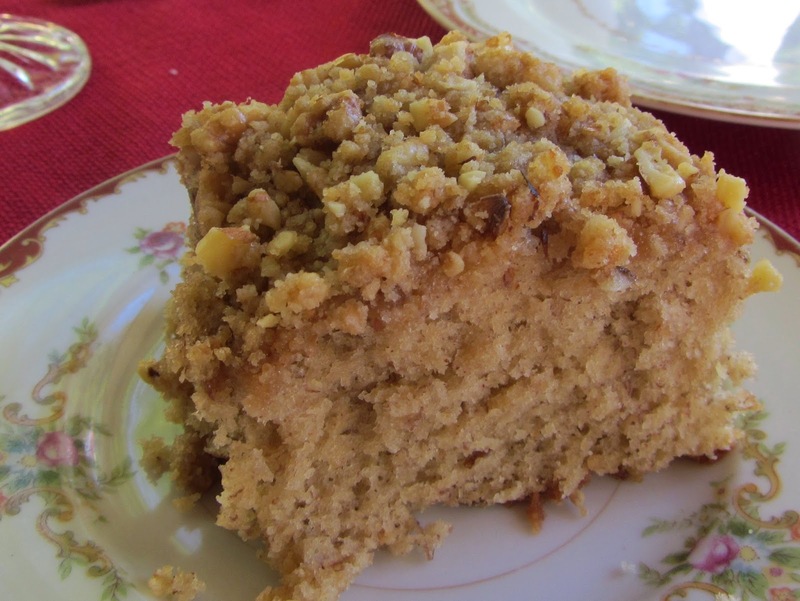 This cake is rich, buttery and nutty! Served with vanilla ice cream or better yet Butter Pecan ice cream, to die for! The last few years this has become my Christmas cake. After all the pies at Thanksgiving and so much fruity stuff I thought this cake was a great change. Place pecans and 1/4 cup of butter in a baking pan, bake at 350 degrees for 20 - 25 minutes. Stirring often until golden brown and aroma is rick and nutty. Sift into a medium bowl flour, salt, and baking powder. In large bowl, cream butter and sugar for 2 minutes until light and fluffy. Beat in eggs, one at a time. Starting with milk and ending with flour, alternate incorporating the milk and flour mixture into the sugar and butter. Stir in the vanilla and 1 1/2 cups of butter pecans. Pour batter into 3 greased and floured 9" cake pans. Bake at 350 degrees 25 - 30 minutes; remove from pans and cool. Cream butter and sugar, add milk and vanilla; beat until smooth. Stir in remaining pecans. Spread frosting between layers, top and sides of the cake. I generally NEVER use a box mix for anything but I was feeling lazy and just happen to have a cake mix in the cupboard. I dusted off the box and changed up the recipe a bit. The cookies cooled and everyone loves them. Soooo... for an easy quick cookie fix here is a good one. Preheat oven to 350 degrees. In a large bowl, combine cake mix, eggs and oil. Mix well (dough will be thick and sticky). Roll tablespoonful's of dough into balls. Press caramels into each and reshape. Press tops of cookie balls into chopped toasted almonds and place an inch apart on a cookie sheet. Bake 8-10 minutes. Cool for 2 minutes before moving to wire rack. Yummy! A yummy fast easy appetizer! Finger food, cheesy, and spicy if you like. This recipe can be varied to your taste. Take out the red pepper and add olives, make this one your own! In a skillet, cook and crumble sausage until no longer pink; drain and cool. In a bowl, combine biscuit mix and cheese; stir in sausage, red pepper flakes, and red pepper. Add buttermilk and toss with fork until just moistened. Preheat oven to 400 degrees. Scoop balls of 1 tablespoon of mixture onto a cookie sheet, one inch apart. bake for 12 - 15 minutes or until golden brown. Cool on wire rack. Baked puffs can be frozen; reheated at 400 degrees for about 7 minutes. Serve alone or with ranch dressing. Sift flour, baking powder,salt into a large bowl 3 times. Cut in vegetable shortening until it resembles crumbs. Store in air tight container for up to 4 months. Use whenever recipe calls for "Bisquick" or you need a biscuit mix. Dang....that is a mouth full and oh so yummy! This easy to make baked french toast is wonderful for the fall with all the pumpkins and squash that need to be consumed. This is like having pumpkin pie for breakfast! Combine all ingredients to form crumb topping. Set aside in the refrigerator until needed. I love Butternut Squash! Butternut Squash is far superior to pumpkin in flavor and texture when baking. I love Butternut Squash as a side dish it is a sweeter squash compared to other squash of the season. It really is easy to cook, toss the whole squash in the oven on a pan for an hour or so until tender. Remove from the oven let the squash cool, seed and puree. Stir in dry ingredients until combined. Fold in 1 cup of peeled and diced Granny Smith apples. Pour into a 13 x 9 pan sprayed with non-stick cooking spray. Pre-heat oven to 350 degrees. Combine until crumbly. Sprinkle over batter. Bake 40 -50 minutes or until toothpick inserted comes out clean, about minutes. Cool, dust with confectioners' sugar. This rich moist banana cake with a crunchy nutty baked on topping served warm is fantastic for any breakfast or brunch. Come to think of it, as a cake it could be served anytime, it is so delicious! Made in a 13 x 9 pan this coffee cake will easily serve 16 but can be cut for 20. This is a simple recipe but does a few steps so plan a few extra minutes for prep. Combine butter and sugar in a skillet. Place the pan over medium low heat and cook, stirring until sugar is dissolved. Place the bananas in the pan cooking until the bananas start to soften. Slowly add the rum. Continue to cook until bananas are brown and sugar and rum have thickened. Pour bananas into a small bowl and set aside until needed. Put all the ingredients, except the nuts, into a food processor and pulse just until the mixture form clumps and holds together when pressed. Turn topping into a bowl, stir in the nuts. Cover and refrigerate until needed. In a large bowl beat butter and sugar at medium speed a couple minutes until light and fluffy. Add the eggs one at a time, beat for one minute after the eggs are added. Add vanilla. Add flour and buttermilk alternately ending with the flour. The batter will be thick and creamy. Add the banana foster's mixture and mix on medium speed, integrate the bananas so there are no visible clumps. Spray a 13 x 9 pan with non-stick cooking spray and pour batter into the pan. Remove crumb topping from the refrigerator and break into small pieces. Scatter crumbs over the batter. Preheat oven to 350 degrees F. In a large skillet, crumble sausage and cook until sausage is browned, add onion, saute; drain thoroughly. In a medium bowl beat together cream cheese and half and half until smooth. I find it easiest to add the eggs one after the other and mix the cream cheese with the milk. Stir in bread pieces, Swiss cheese, zucchini, green bell pepper, celery, black olives, salt, pepper, and garlic. Transfer to the sausage mixture and toss until mixed together. Pour into greased 9-inch square cake pan or 9-inch deep pie pans or ramekins. Bake for 30 to 45 minutes or until the center is firm. Serves 6. Living on an apple orchard, growing up in Michigan, gave me my love for a good apple. So, starting with beautiful, fresh, crisp apples makes for the best apple compote. I like a tart apple. I will always use at least 2 different types of apples for flavor. Size is of no matter if the are red and juicy. In a large saucepan, combine the water, sugar, vanilla, brandy, cinnamon, cloves and nutmeg with salt bringing to a boil. Boil gently until the sugar is dissolved and the mixture thickens slightly, about 5 minutes. Add the apples and return to a boil. Lower the heat and simmer, stirring occasionally, until the apples are cooking tender but still crisp, about 20 minutes. Remove from heat and let cool to room temperature and serve. Top with granola if you like. Dice ham steak and pan fry in maple syrup to glaze the ham. When all the moisture has cooked off remove from heat; set aside. Dice onion and saute for about 7 minute to caramelize; remove from heat and set aside. Spray a 13 x 9 baking dish wit non-cook spray. Preheat oven to 350 degrees. Cut croissants in half. In a large bowl whisk eggs and half and half, milk, 1 tablespoon of mustard and salt. Submerge and soak the bottom of each croissant in the egg mixture until soft, place in baking dish. Continue until all croissants are in the baking dish. Spread the remaining mustard on the bottoms of the croissants, layer with ham, onion and cheese. Submerge and soak the tops of the croissants in the egg mixture until soft and place a top on each bottom. Bake for 20 - 30 minutes. In a saucepan, mix butter, brown sugar, Worcestershire sauce, Dijon mustard and poppy seeds. Bring to a boil and simmer for 2 - 3 minutes. Drizzle over croissants when serving. Heat oven to 350 degrees. Spray muffin tin with non-stick cooking spray. Toast pecans in oven for about 7 minutes, you should start to smell them, watch them closely, and remove them before they over brown. Set aside to cool. Repeat this step for the 1/2 cup of coconut. Again watch the coconut closely so it does not over brown. It will brown fast! In a large bowl, mix the flour, baking powder, baking soda, and salt. Set aside. In a medium bowl, melt the butter and allow to cool, add and mix in sugar, beat in the eggs. Add in the buttermilk and sour cream, mix until incorporated. Pour the wet ingredients into the dry, mix together just until moistened. Fold in the pineapple, pecans, untoasted coconut and orange zest. Spoon into muffin tins and bake at 350 for 18 minutes or until golden brown. Insert a tooth pick and when it comes clean the muffins are done. Makes about 26 muffins. Make the glaze. Put the confectioners sugar in a bowl and add the pineapple and orange juices. Whisk to mix well and remove any lumps. Place the muffins on the cooling racks over a paper towel and spoon some of the glaze over each of the muffins. Right after glazing the muffins, sprinkle the toasted coconut over each one. the toasted coconut helps "set" the glaze so they are not as sticky later. Preheat oven to 350 degrees. Sift flour, baking powder, salt, baking soda, and nutmeg together. Combine milk and buttermilk; set aside. In a large bowl cream butter and sugar with an electric mixer. Add eggs one at a time. Add flour mixture alternately with milk mixture to combine remaining ingredients. End with dry ingredients; do not over mix. Prepare muffin pans with non-stick cooking spray. Divide the batter into the muffin cups and bake for 20-25 minutes or until tester comes out clean. Remove muffins from pan and cool on a wire rack. Dip in butter and cinnamon and sugar. Serves 18. Combine cinnamon and sugar in a small bowl; mix well. Dip cooled muffins into melted butter and then roll them in the cinnamon and sugar. This cake-like muffin has a delicate lemon flavor with a sweet crumb topping. The batter freezes well. 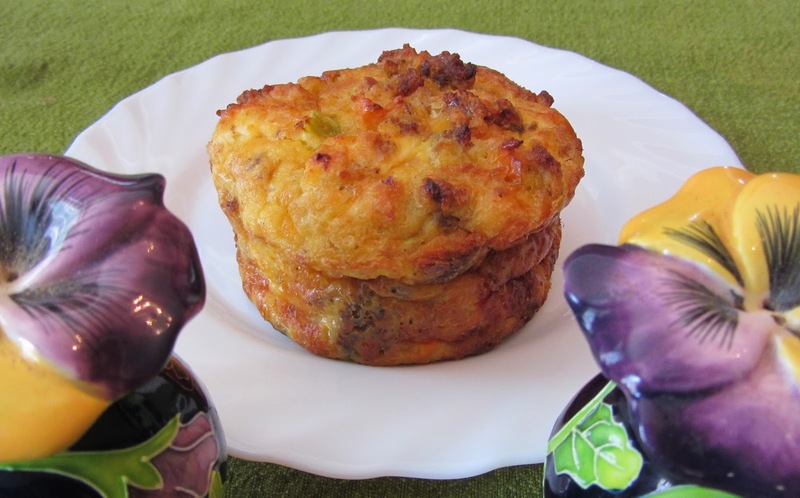 Just freeze in the muffin tin, pop out when frozen and store in an airtight container. Select the number of frozen muffins you would like to bake; place frozen muffins into greased muffin tin. Bake frozen muffins at 350 degrees for just a couple minutes longer than the unfrozen batter. In a bowl whisk together flour, soda, and salt. In a large bowl melt butter in microwave, add sugar and mix using an electric mixer, add eggs beat until fluffy. Add sour cream, lemon peel and lemon juice. Stir in dry ingredients just until moist. Fill greased muffin tins 3/4 full. In a small bowl, combine sugar, flour, and butter. Cut in butter until mixture resembles crumbs. Sprinkle over muffin batter. Spring time is here and berries are starting to appear in the stores. With so any different ways to enjoy these beautiful little fruits, you just cannot resist them. One of my favorite ways to enjoy berries is baking something up at the Avenue Hotel Bed and Breakfast for guest to linger over. This cake is a rich dense fruity morning delight! In a large mixing bowl using a hand mixer, combine the first 10 ingredients and mix on medium high speed until smooth and combined, about 2 minutes. Stop, scrape down the sides of the bowl and mix on medium high speed until smooth about 1 minute. Transfer batter to prepared pan. Arrange raspberries uniformly over the top of the batter ( looks like a lot but they will sink down and while baking. Sprinkle with 2-3 tablespoons sugar evenly over the berries. Bake at 400 F for 30 minutes. Lower the temperature to 375 F and bake for another 20 - 25 minutes, or until cake is golden brown and set in the center. and toothpick inserted comes out clean. Moist crumbs dangling ok but no batter. If you're using fresh berries your cooking will be considerably less. Watch your cake not the clock. Place on cooling rack. While cake cools make frosting. Combine all ingredients in a small bowl and beat until smooth. This does make more frosting than some may like so be the judge of how much to put on your coffee cake. This chocolate muffin will satisfy your chocolate needs! A great addition to brunch or any coffee break. The secret is the chocolate chips which add the creamy rich semi-sweet bits. They bake up beautiful and are an easy recipe to make and have ready. Preheat oven to 350 degrees. Combine flour, cocoa powder, sugar, baking powder, salt, and instant coffee in a large bowl and whisk. In a separate smaller bowl beat eggs; add milk, butter, oil and vanilla. Pour wet ingredients into dry ingredients and mix just until incorporated. Do not over mix. Fold chocolate chips into the batter. Spray muffin tins with non-stick cooking spray. Spoon batter into muffin tins about 2/3 full. Bake 18 - 20 minutes or until toothpick inserted comes out clean. Remove muffins from pans and cool. Dust with powder sugar when cool. Makes 18. In a saucepan, bring water, butter and salt to a boil. Add flour all at once and stir until a smooth ball forms. Remove from heat; let stand 5 minutes. Add eggs, one at a time, beating well after each addition. Continue beating until smooth and shiny. Drop by rounded teaspoons 2 inches apart onto greased baking sheet. Bake at 400 degrees for 15 minutes or until golden brown. Remove to wire rack. Immediately poke with a toothpick to allow steam to escape; cool. 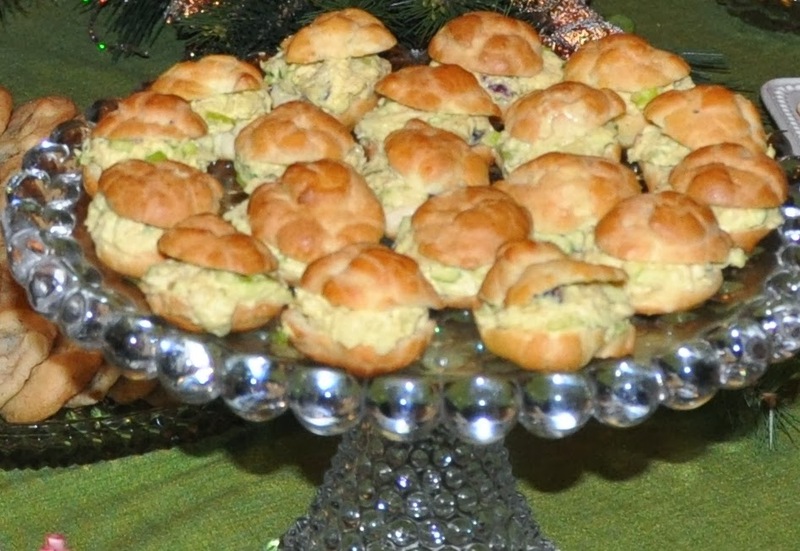 The cream puffs can be made ahead and frozen, they freeze well for several months. Split puffs and set aside. In a bowl, combine the filling ingredients; mix well. Remove tops, fill puffs and replace tops. Refrigerate until serving. Refrigerate leftovers. Serves 18 - 24 depending on the size of the puffs made. Found on page 80 of my Breakfast and Beyond Cookbook. A coconutty baked chicken tender with a tangy sauce with a bit of a kick. A big favorite at any occasion. They are a filling appetizer and the chicken can be cut into smaller pieces for more serving pieces. I copied this recipe many years ago, made a few changes,here it is for you to try. 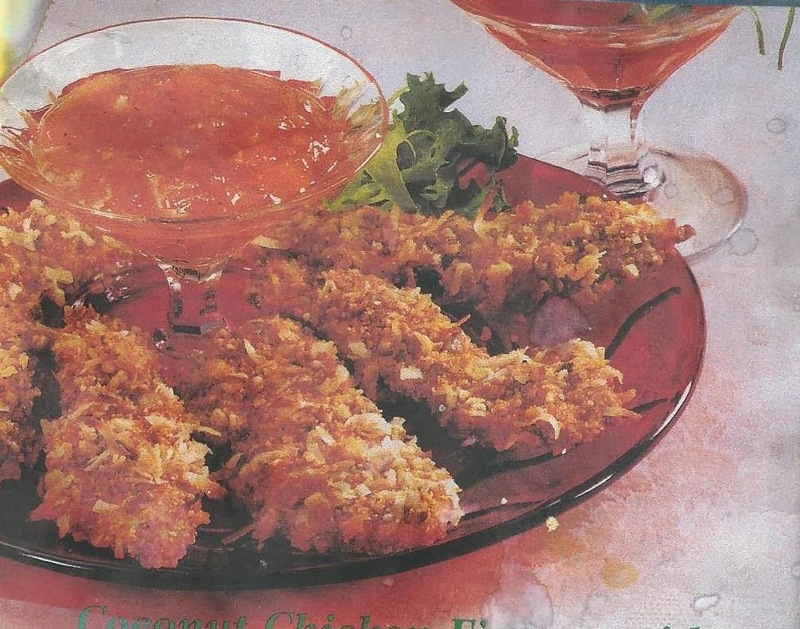 The picture is from the old magazine from which the recipe was found. Pre-heat oven to 400 degrees. Combine all sauce ingredients. Mix well. Cover and refrigerate. Process pecans in a food processor until finely chopped; add corn flake crumbs and coconut. Pulse to blend. Place in a shallow dish. Combine egg and milk in a separate shallow dish. Place flour and salt in another separate shallow dish; mix well. Dip chicken strips into flour mixture until well coated. Dip flour coated chicken into egg mixture, then into pecan misture. Press coating onto chicken. Spray 15 x 10 baking sheet with non-stick cooking spray. Place well coated chicken strips on the pan. Bake 10 -15 minutes or until no longer pink inside. Serve chicken with sauce. Makes 8 appetizer servings. Page 79 in my Breakfast and Beyond Cookbook. Combine the water (or broth) and rice in a large saucepan. Bring to a boil, cover and reduce heat, simmer until tender, about 35 minutes or until tender. Or if you prefer to use a rice steamer, cook rice accordingly. Drain if necessary. Transfer rice to a large bowl. Fluff with a fork and let cool. Mix in the rest of the ingredients, except the dressing. Serves 8 -10 as a side dish and 6 as a main course. Whisk the dressing ingredients in a small bowl to blend. Pour over the rice salad and toss to coat. Season to taste with salt and pepper. Chill before serving. Overnight is best. This recipe is on page 152 of my "Breakfast and Beyond" Cookbook. For Cake: Preheat oven to 350 degrees. Spray a 13 x 9 pan with non-stick cooking spray. In a medium mixing bowl sift together flour, salt, and baking powder. Add milk, eggs and vanilla and combine until well mixed; slowly pour in the melted butter. For Topping: In a medium mixing bowl mix 1 cup of butter, brown sugar, flour and cinnamon together until well combined and creamy. Drop evenly over the bater by the tablespoonfuls and use a knife to marble/swirl through the cake. Bake at 350 for 35 to 40 minutes or when a toothpick inserted near the center comes out clean. For Glaze: In a medium bowl, mix the powdered sugar, milk and vanilla together with a whisk. Drizzle evenly over the warm cake. Serve warm or at room temperature.